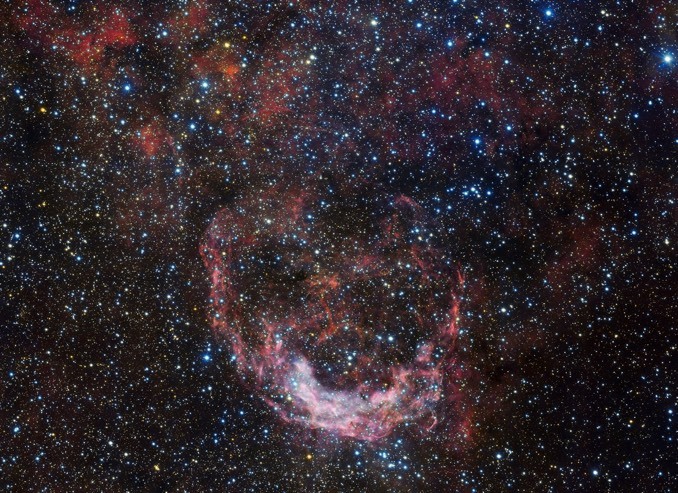 The European Southern Observatory’s VLT Survey Telescope captured this spectacular view of NGC 3199, a “crescent-shaped cocoon of gas and dust” in the southern constellation of Carina some 12,000 light years from Earth. The nebula was first noted by John Herschel in 1834 and added to his catalogue of interesting objects. The bright crescent feature is part of a much larger, fainter cloud of gas and dust. 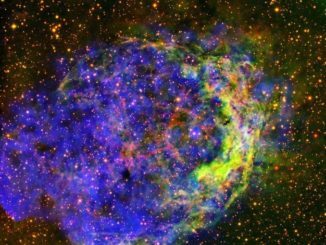 It also contains a massive, extremely hot Wolf-Rayet star known as HD 89358 that blows intense stellar winds into the surrounding environment, helping shape NGC 3199’s lopsided structure. This wide-angle view comes courtesy of the VST’s 256-megapixel OmegaCAM camera, which can image an area twice the size of the full moon. 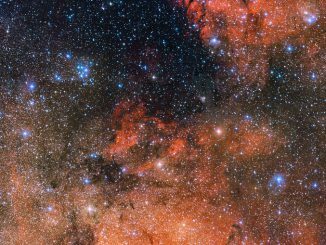 Messier 18 is the small smattering of bright blue stars upper left of centre in this small-scale version of the original mammoth 30,577 x 20,108 pixel ESO image captured by the OmegaCAM camera attached to the VLT Survey Telescope (VST), located at the European Southern Observatory’s Paranal Observatory in Chile. 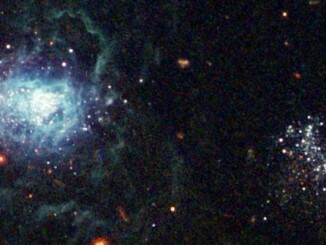 Dwarf galaxy I Zw 18 stands out for its extreme scarcity of heavy elements, a characteristic typical of primeval galaxies. A map of ionised helium in the galaxy has just been published, indicating the presence of peculiar stars similar to the first that ever shone in the universe.